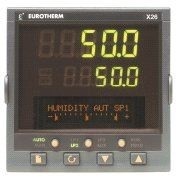 Accurate programming of temperature and humidity is provided by the advanced X26 controller. 50 customer named programs can be stored with up to 100 steps per program and 500 steps in total. Boost heat, boost cool and compressor On/Off outputs are included as standard. Two user programmable event outputs are available to activate external devices – such as vibration test equipment. A real time clock can be set to start a program at defined times of the day of week. Program profiles can be set up either through the controller front panel or from iTools, a windows setpoint program editor. This allows the storage of an unlimited number of programs and easy editing and transfer of programs between controllers. iTools software will save and reproduce, the complete configuration of the controller. It also provides trend plotting facilities for monitoring the process. The advance features include program holdback, to guarantee soak time at temperature and humidity and six sets of PID parameters to give accurate control under varying combinations of temperature and humidity. 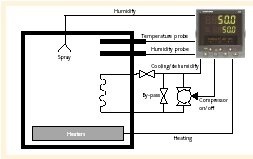 The humidity can be derived from wet and dry bulb inputs or taken directly from a humidity probe. Modbus digital communications is available for connection to supervisory computers or Programmable Logic Controllers.